"So Happy To See You"
I've been doing a lot of R&D this spring and summer with steel mesh and paperclay slip. Finally, I got to complete a piece. "So Happy To See You" is a collection of 11 organic-looking pods presented on a custom made wooden stand. The pods are fabricated out of wire mesh and then dipped in Gault 10 paper clay slip to the thickness I desired. 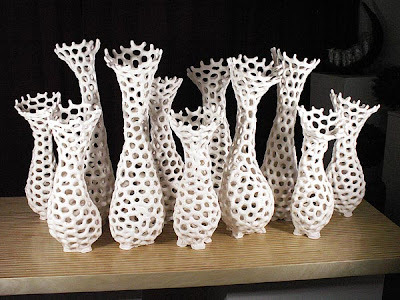 They are bisque fired to Cone 06. The base is birch plywood laminated with the end grain showing and finished with hand rubbed polyurethane which brings out the natural color of the birch. Small feet are attached to the base to lift the entire installation off the pedestal giving it a "floating" feel. This piece is meant to be seen from all sides and the view is invited to walk around the work to take in the different perspective. I hope you get a smile when you see the pods greeting you.